Aronia liqueur is a very popular product because of its specific sweet-sour taste, and thanks to its many medicinal properties. Aronia is very important for the prevention of heart disease and cancer, it is important to improve blood circulation and healthy blood vessels. It is used for eye health, the prevention of diabetes and stomach problems, and as a remedy for colds. North America is the home country of the berry plants, it is also grown in Russia. Among the inhabitants aronia is known as - Siberian blueberry. It does not require chemical protection and is therefore very healthy, suitable for making teas, liqueurs, juices, syrups and jams. Learn how to make home-made liquor from aronia for better health, and learn through this article all about the composition and health benefits of this valuable berry plant. How does Siberian blueberry looks like? Aronia is a bushy plant rather resistant to low temperatures and frost. It is resistant to pests and does not require chemical treatment, virtually it has no real enemy. It thrives in all types of land, but is not resistant against draught. It belongs to the family of fruits with blueberries, raspberries and currants. There are three types: black, red and purple. The edible part of the plant is fruit, known for the smooth juicy structure, round shapes and intense colours. From them we obtain healing juice and syrup, or the increasingly popular home-made liquor from chokeberry. Fruits are best eaten during the season, during the summer, because freezing and processing loses a lot of nutrients. Siberian blueberries are rich in vitamin C. It helps collagen production, and in the cosmetics it is used to rejuvenate and improve skin conditions. In addition boosts immunity and fights bacteria and viruses. In the spring you will be delighted by the beautiful white flowers during the summer fruits, and with the arrival of autumn, its leaves will get an unusual red colour. It is especially prized among gardeners in England. An interesting fact is that this berry is used to mitigate the effects of radiation after the Chernobyl nuclear accident. In addition to the aforementioned vitamin C, its composition also includes vitamins A, B9, E, K and P, which are important for health and bone strength, good vision and a beautiful skin. Vitamin A maintains teeth, skeleton and keeps the soft tissue healthy and functional, so dried berries are recommended as a healthy juice and home-made liquor from chokeberry. Vitamin B9 is known as folate or folic acid, and is necessary for the body for producing new red blood cells which carry oxygen to all the vital organs. Vitamin K is important for blood coagulation, while vitamin E is essential for maintaining muscles and blood vessels. Vitamin P is known for its antioxidant properties and the ability to slow down the growth of tumours. In addition to vitamins, Aronia contains minerals and is rich in iron, zinc, magnesium, manganese, calcium, potassium and sodium. Iron is essential for healthy blood and for the lack of it which causes anaemia, which occurs more frequently in women. Calcium takes care of the health of bones and skeletons, regularly drink juice and liqueur of Aronia for the prevention of osteoporosis. The mineral potassium is essential for the functioning of the cardiovascular system, and nerves. Sodium is important for blood pressure and a number of physiological functions. Magnesium is responsible for the proper functioning of the heart, kidney and muscles. Manganese is an essential element essential for the normal functioning of liver, kidney and brain. Siberian Aronia is the best and strongest antioxidant according to numerous studies, rich in phytonutrients, folate and dietary fibre. It has anthocyanins, which protect the body against inflammation and neurological diseases. The most popular products in this area are definitely tea, jam and natural medicinal liquor from aronia for circulation and overall health. Aronia is a powerful antioxidant, berries of these plants have the highest concentration of antioxidants than any other fruit. Their importance to the organism is high, and its primary function is to fight against free radicals and oxidation processes responsible for the destruction of healthy cells in the body. Aronia berries enhance blood circulation, strengthen blood vessels and reduces the risk of heart disease. When they mature they are full of phenols that are used for the treatment pf veins and body. Besides speeding up the healing of wounds, cleans the body of toxins, soothes inflammation, improves elasticity prevent them from clogging. You can drink liquor from aronia for better circulation, and in folk medicine this is a known cure. Blueberry from Siberia helps regulate blood pressure. The dark pigment aronia prevents spasms of blood vessels and veins, maintaining the pressure in the normal range. It is suggested to eat aronia for poor circulation and hypertension. Urinary tract infections are very common, affecting millions of people across the globe. The most common cause is the bacteria Escherichia coli. The symptoms are extremely painful and unpleasant, pain in the lower abdomen, frequent urination, which is accompanied by tingling and pain, as well as the appearance of turbid liquid. In the treatment of such disorders commonly used is cranberry although according to research aronia is 5-10 times stronger because of high doses of acids that prevent urinary tract infections. Drink medicinal syrup or occasionally take curative liqueur of Aronia with wine. Aronia is of great importance in the treatment of stomach ulcers, inflammation of the intestinal lining and diarrhoea. It has a beneficial effect on the health of the kidneys, gall bladder and liver. In the treatment of stomach diseases chokeberry tea is particularly good, although the consumption of liquor has a significant operation to relieve some stomach problems. Aronia liqueur is recommended to relieve pain and diarrhoea, only one cup a day. Free radicals are the cause of many diseases. Blueberries are rich in antioxidants and are used in the prevention of diabetes. Diabetes has become a disease of modern times and a large part of the population has some form of diabetes. Aronia consumption can significantly lower blood sugar levels, so people with a predisposition for the development of this disease in order to prevent and to mitigate the problems are advisable to use it. Regular consumption of berries can protect the body against colds and flu. Aronia destroys bacteria and viruses, and boosts the immune system. For these purposes, usually tea is used. 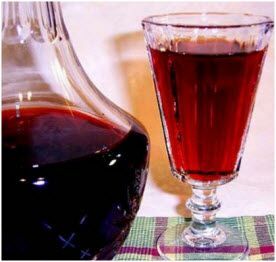 If you are not a fan of tea, you can for the treatment of colds and flu use Russian folk recipe - Aronia liqueur with brandy, which will have a much more powerful and faster effect. These medicinal berries contain large amounts of carotene, which protects the eyes and eye cells. Carotene prevents the occurrence of age-related cataracts. Besides Siberian blueberries are rich in flavonoid antioxidants, such as lutein and zeksantin protecting eyes from UV radiation, macular disease, and age-related eye infections. Homemade aronia liqueur for pain relief is quite reliable. It is particularly effective in severe headaches, which occur as a result of migraine. They are very tricky, they are characterized by a sharp pain in certain regions of the head. Often patients in addition to regular therapy are recommend alternative ways, a Siberian blueberry proved to be successful. The significance of red berries in the treatment of cancer and sciences is confirmed. Aronia has proven to be an effective tool in the treatment of colon cancer. According to a study conducted in 2003 Siberian blueberries are natural prevention of occurrence and development of colon cancer. Research conducted at the American University in Ohio showed that aronia kills fifth incurred cancer cells, while at the same time does not destroy healthy cells. With the help of this berry you can regulate weight. Aronia prevents the deposition of fat in the abdominal area, which is a problem of a large number of people. It improves metabolism and stimulates bowel movement which is important for weight loss. Of course, for maximum effect before a special year, the most important is the physical activity to achieve good shape. If you are interested only in its application for losing weight, homemade liqueur from Aronia will not help much, but you need to eat fresh berries. In addition, adding Siberian blueberries in any other diet, improves the lipid profile and influences cholesterol levels. Aronia has been used for centuries for skin care. Cosmetic products based on aronia help the skin maintain its elasticity and thus prevents the formation of stretch marks and cellulite. It is used for skin care, recommended for the treatment of dry and mature skin which loses collagen and is prone to developing wrinkles. Excellent food for hair, giving it a glow and firmness. Natural shampoos with chokeberry are very fragrant and suited for the scalp. This product is hard to find on sale, but domestic liquor from aronia can be made at home. It will surprise for being very simple. The recipe is not complicated, here are a few examples so see for yourself. Wash aronia and put it into a larger jar and then add the sugar and pour brandy. It should be enough to submerge berries. Cover the jar and leave for 5 weeks in a bright place. After that, strain the contents of the jar and the resulting liquor pour into a glass bottle. In this way you can get a perfectly healthy and delicious liqueur with brandy, excellent for consumption before meals, as an aperitif with black coffee, for example. Wash Siberian blueberry well, chop the lemon and ginger, and put them in a larger jar. Add sugar and other spices and finally pour brandy. All the ingredients are thoroughly mixed and then close the jar. Keep in a bright room in the sun at least 6 weeks. Strain the content and pour into a clean glass bottle. This is the healthiest liqueur for cold winter days and the treatment of the common cold. Awakens all the senses and will warm the blood, it takes only one cup a day for excellent health. Aronia and leaves of cherry are cooked in water, then add limuntus and sugar. Cook until they melt, then add the brandy and spices. Put out the fire, cover the pot and leave overnight. In the morning, strain the liquor obtained from chokeberry and pour into a glass bottle. First boil the wine with sugar, then add the Siberian blueberry. Cook for 15-20 minutes each and then add the other ingredients and refrigerate. This excellent liqueur from Aronia with wine is free to be consume on a daily basis, but dosed. Blueberries first mix in the mixer, and then let them spend the night in the pot. Cook them a few minutes and then add the sugar. Cook until it is melted with continuous stirring. This takes a few minutes. When the mixture is united, pour in glass jars. Boil water and sugar, and then add blueberries with constant stirring continue the cooking. When you get a compact smooth mixture pour into warmed glass jars. In preheated oven put jars with jam and bake until a crust forms on top. All the ingredients are first put into a pot and cook the mixture until it boils, then on light fire cook for another 30 minutes. What is the price of chokeberry products in stores? Buying liquor from aronia in stores costs about 4-5 dollars. It is also very good and tasty, but it is quite hard to find it on sale. If you want to buy one try in specialized stores for alcoholic beverages or order it over the Internet. However, as you can see, this drink is not difficult to prepare by yourself and it does not require a lot of time, but the necessary ingredients are not too expensive. It is best to create your own home-made liquor from chokeberry for your needs. While healthy, Siberian blueberry is very strong, so it is recommended to limit the consumption. This applies equally to the syrup, tea and medicinal liquor. If you drink too much you will feel sick to the stomach, and even have an urge to vomit. Pregnant women can eat aronia, just not in the first quarter when they are not allowed, or consume the liquor during the pregnancy. If you are already tried Aronia liqueur with wine or brandy and you like eating them, we suggest you read about how to make aronia juice.